"From a magic world where dreams come true, My Magic Genies help grant wished for you! 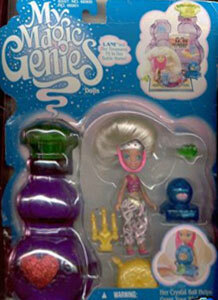 Ask each exotic genie what you wish for most dearly, she'll tell you her answer quite clearly. 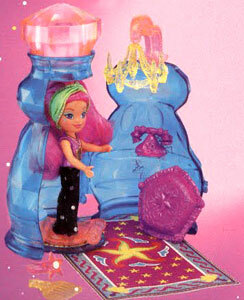 Then she's off with her favourite pet by her side to her glittery palace on a a magical carpet ride! 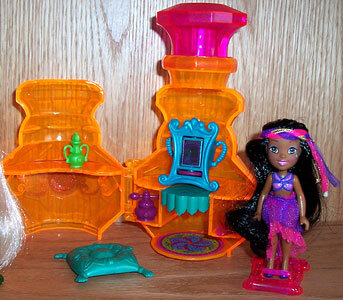 So many exotic adventures in store - there's a world of magic for you to explore!" 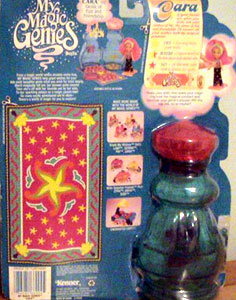 My Magic Genies were produced by Kenner (aka Hasbro) in 1995. 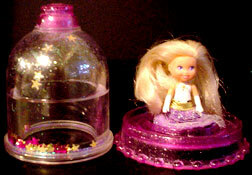 They were a series of small genie dolls and animals with plastic bottle houses. 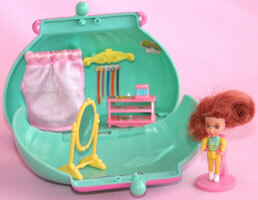 Each set came with several small accessories and there was also a playset. 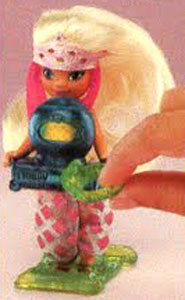 Images on this page thanks to Pranceatron, www.cagle.com, Flickr user Veni Vidi Dolli or found on eBay ! 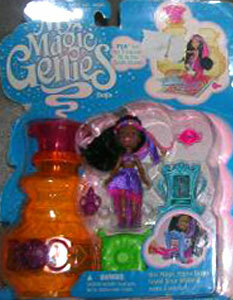 View all My Magic Genies on eBay.com or eBay.co.uk ! 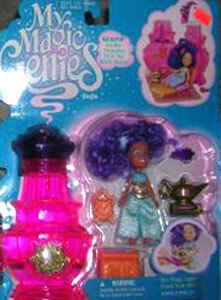 "Magical, beautiful genies who help grant girl's wishes! 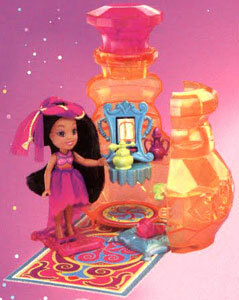 Distinct costumes and lovely, long hair make each genie special! 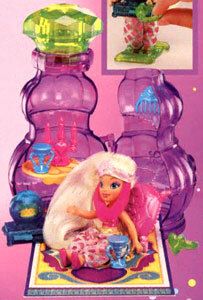 Dolls and all accessories fit in unique jewel-tone genie bottle homes! 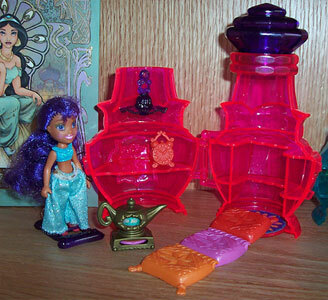 Girls activate magic lamp, crystal ball, magic mirror, or magical pendant to find out answers to yes or no questions! 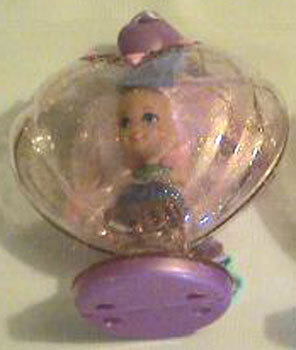 Includes magical ring for girls to wear! 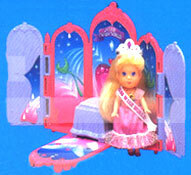 Each comes with lots of themed accessories, plus magic carpet and scroll package cut-outs!" 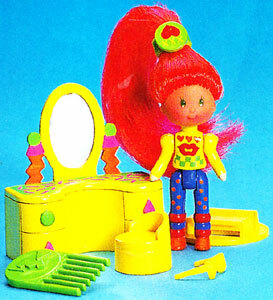 There were four dolls produced. 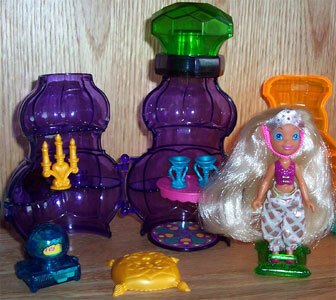 All of the dolls had a cardboard "carpet" on the back of their card that could be cut out (as pictured left) and came with various small accessories along with their bottle homes. 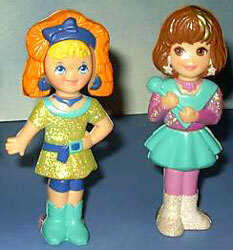 Lani and Pia's accessories were produced in two or three colour variations. 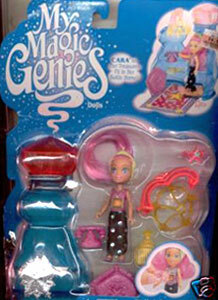 Cara, the genie of fun and friendship - she has a magical pendant! 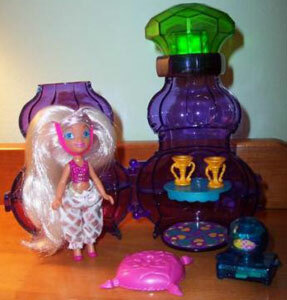 Lani, the genie of love and romance - she has a magic crystal ball! 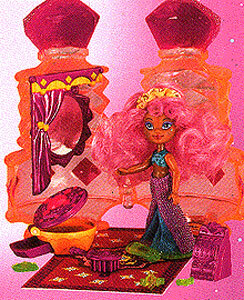 Pia, the genie of glamour and beauty - she has a magic mirror! 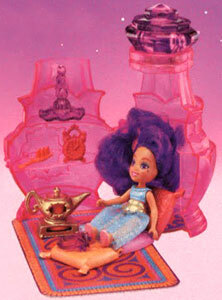 Serina, the genie of dreams come true - she has a magic lamp! 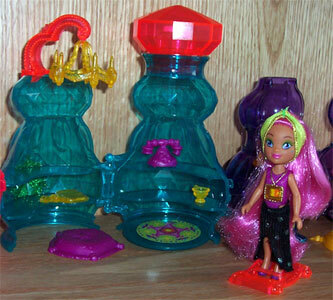 I've not come across any colour variations for Cara's accessories yet. 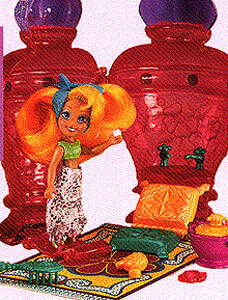 Lani's cushion and candelabra was produced in pink, yellow and blue and her goblets in blue and yellow (and possibly pink). 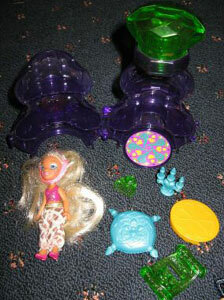 Pia's cushion was produced in blue and green and her two small perfume bottles were each produced in both green and purple. 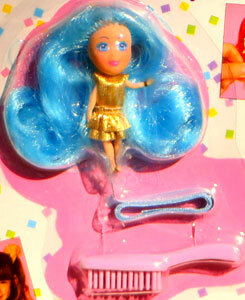 I've not come across any colour variations for Serina's accessories yet. 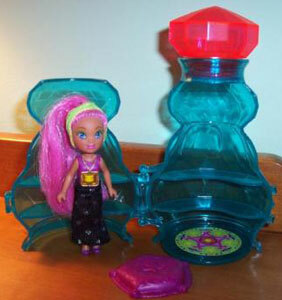 The series was set to go into a second run, but it doesn't appear to have ever been produced for sale.